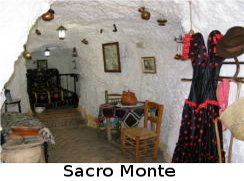 Lola Medina was so fond of dancing the Flamenco and so attached to her cave in Granada, she decided, when she bought her field close to the sea in Torremolinos, to create the same atmosphere. 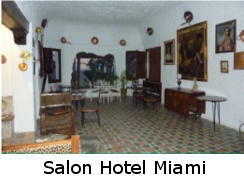 The main room of this small palace is the big salon, presided by the chimney. It is tipical for the gypsy in their caves. The floor is the original one, with Granada's mosaics, in this room, close to the chimney and in the garden. You can almost smell the gypsy's atmosphere, when they claped their hand to give the rythm to Lola when she danced the Flamenco. The floor whas made by the famous ceramic's factory of Fajalauza, which is situated in Albaicin (Granada), and still exists today being the most important in Spain for this style. The walls were built in order to imitate the ones in the caves in Granada, and the decoration is the same also (as you can see in the pictures). Juan Goitisolo, writter considered as the most important of the half 20th century in Spain, used to say that none of the VIP in Spain who used to like the caves in Granada and the flamenco style, would have come to Torremolinos, without visiting the hotel Miami, where Lola Medina used to live.